North led the J and declarer won with the ace and cashed dummy’s top trumps. 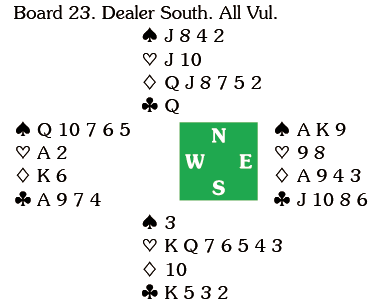 When South pitched a heart on the second round declarer played the six of clubs to his seven and North’s queen. Back came the 2 and declarer won in hand and exited with a heart. North won with the ten and returned the Q. Declarer won in dummy and ran the J, but North ruffed and exited with the J. Locked in hand declarer had to surrender a club at the end for one down. 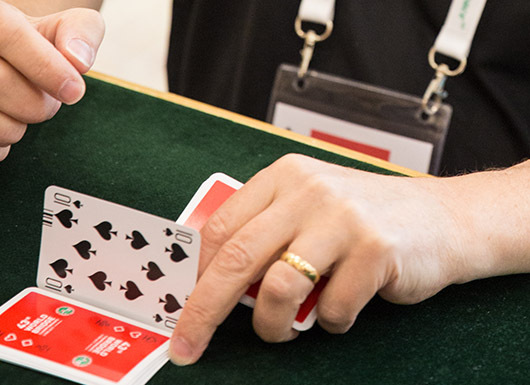 Instead of exiting with a heart, declarer could have cashed the Q and then exited with a spade. The defenders can cash a heart, but declarer will take the rest. Declarer won the heart lead, played three rounds of spades ending in dummy and ran the J. North won, cashed the J and exited with a heart. South won but declarer had the rest and 12 IMPs.